A thermistor is a type of resistor whose resistance is dependent on temperature, more so than in standard resistors. The word is the mix of thermal and resistor. Thermistors are widely used as inrush current limiter, temperature sensors (NTC type typically), self-resetting overcurrent protectors, and self-regulating heating elements. The first NTC thermistor was discovered in 1833 by Michael Faraday, who reported on the semiconducting behavior of silver sulfide. Faraday noticed that the resistance of silversulfide decreased dramatically as temperature increased. (This was also the first documented observation of a semiconducting material.) Because early thermistors were difficult to produce and applications for the technology were limited, commercial production of thermistors did not begin until the 1930s. A commercially viable thermistor was invented by Samuel Ruben in 1930. Thermistors can be classified into two types, depending on the classification of k.
If is positive, the resistance increases with increasing temperature, and the device is called a positive temperature coefficient (PTC) thermistor, or posistor. If is negative, the resistance decreases with increasing temperature, and the device is called a negative temperature coefficient (NTC) thermistor. •	As resistance thermometers in low-temperature measurements of the order of 10 K.
•	As sensors in automotive applications to monitor things like coolant or oil temperature inside the engine, and provide data to the ECU and to the dashboard. •	To monitor the temperature of an incubator. •	Thermistors are also commonly used in modern digital thermostats and to monitor the temperature of battery packs while charging. •	Thermistors are often used in the hot ends of 3D printers; they monitor the heat produced and allow the printer's control circuitry to keep a constant temperature for melting the plastic filament. •	In the Food Handling and Processing industry, especially for food storage systems and food preparation. Maintaining the correct temperature is critical to prevent food borne illness. 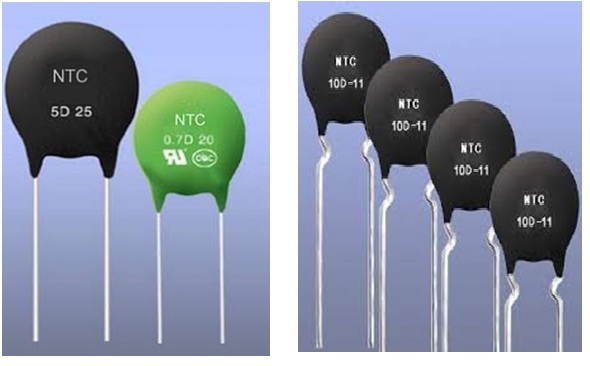 In NTC thermistor, when the temperature increases, resistance decreases. Conversely, when temperature decreases, resistance increases. Thus this type of thermistor is used when we want to increase the current in the circuit as the temperature is increased. example: fire alarm. In PTC thermistor when the temperature increases above some threshold value, resistance increases drastically. This type of thermistor is required when we want to stop the flow current when temperature is high. Example: Automatic cutoff system in electric geysers. The connections are made such that one leg of the thermistor is connected to the base of the transistor and its other leg is connected to Vcc(positive/high voltage). The emitter of the transistor and one end of the base resistor are grounded (negative/low voltage). When the surface of the thermistor is exposed to heat, the LED starts glowing. The LED turns OFF the moment the temperature of the thermistor falls below the threshold value. The thermistor used is a negative temperature coefficient (NTC) resistor. The reason LED glows is that when the thermistor is heated, its resistance decreases due to which the base voltage increases and point comes when the base-¬‐emitter junction is forward biased. As a result the transistor turns on and an output current ﬂows from its collector to the emitter, making the LED glow. Thermistors have some benefits over other kinds of temperature sensors such as analog output chips (LM35/TMP36 ) or digital temperature sensor chips (DS18B20) or thermocouples. •	First off, they are much much cheaper than all the above! A bare 5% thermistor is only 10 cents in bulk. •	They are also much easier to waterproof since its just a resistor. •	They work at any voltage (digital sensors require 3 or 5V logic). •	Compared to a thermocouple, they don't require an amplifier to read the minute voltages - you can use any microcontroller to read a thermistor. •	As heater in automotive industry to provide additional heat inside cabin with diesel engine or to heat diesel in cold climatic conditions before engine injection. •	In temperature compensated synthesizer voltage controlled oscillators. •	In lithium battery protection circuits. •	In an electrically actuated Wax motor to provide the heat necessary to expand the wax. 1. The current flowing in the circuit is directly proportional to the temperature of the surrounding because we have used an NTC thermistor in the circuit where the resistance of thermistor is inversely proportional to the surrounding temperature in which the thermistor is kept. 2. Increase in base voltage results in the glow of LED. To increase the base voltage we need to use a variable resistor which can forward bias the base-emitter junction of the transistor to initiate the flow of collector current which makes LED glow. Thus we use NTC thermistor to provide variable resistance.